So I picked up a rotisserie chicken from Wegmans for dinner, and I started to crave ketchup to go with it. I remember a while back reading one of my Grandma’s books about cooking during the Great Depression, “Clara’s Kitchen.” The book was written by Clara Cannucciari and her grandson, Christopher. It’s a great read, and many of the recipes incidentally happen to be paleo (Clara happened to be in her 90’s when the book was written by the way). I thought “if an Italian grandmother makes this, it must be good.” So I tried it. And it was goooood. And it took me less than 5 minutes to make. Check out the book if you get a chance. There is some vinegar in this recipe, but it’s better than high fructose corn syrup. I imagine you could try to substitute lemon juice for the vinegar, but I haven’t tried it yet. It tastes good even without the salt. Mix together tomato paste, water, garlic, vinegar and salt and put in a sterilized jar. It makes about a cup. Keep refrigerated. I regret to inform you that I have fallen victim to the evils of holiday traditions. Yes, I failed to go completely paleo this holiday season. It is hard to not eat what a little old Irish Grandmother tells you to eat. She is a sweet lady, I couldn’t make her upset. But! 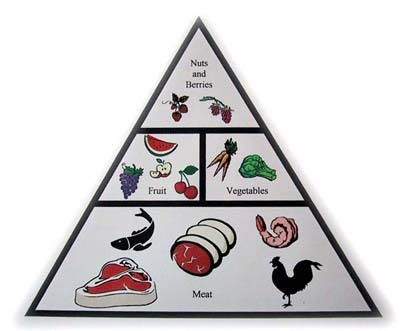 This is a new year and there are a lot of people how have committed to eating paleo for the month of January. Check out hunter-gatherer.com John Durant is going to be doing this as well. So after falling extremely short of my 6 month goal, I will push forward again and go until July of this year. I hope to be announcing something very big in February that the Paleo Diet will help me with. But this is a secret! So please, if you have any words of encouragement they would be very VERY helpful. This is going to be tough, but with the holidays done this should be much easier! Chicken fingers are a quick and easy meal that I like to make at least once a week. I found this recipe at liveprimal.com and then made a few subtle changes. This site contains a wide variety of paleo recipes, so check it out: http://liveprimal.com/LPrecipes.pdf. These chicken fingers are very easy to make. I try to keep the ingredients on hand. These can be cooked in a frying pan, but I find they turn out better if they are baked in an oven. Set the oven to 375 degrees. Cover a cookie sheet with aluminum foil and coat with oil. Place egg into a bowl and beat. Place the almond flour with seasonings into another bowl. Dip each chicken piece into the egg bowl and then dip into the flour mixture. Place each piece on the cookie sheet. Place the cookie sheet in the oven for 30-40 minutes, turning halfway through. The chicken fingers are done when the juices run clear and there is no pink. These can be eaten plain, topped with marinara sauce, or used in salads. The Paleo Diet is not a fad. It is the way the human bodies are designed to take in energy. Try to imagine the first humans for a minute. They didn’t have processed foods, added sugars and all the chemical preservatives that the modern human ingests on a daily basis. They didn’t eat grains or tubers like potatoes. They were hunters and gatherers. They ate natural food. Animals, vegetables, fruits, nuts and berries. Things that didn’t contain toxins that made people sick. Our bodies are designed to eat natural foods; foods that do not require you to cook them to become edible. So why do we do that today? The answer is simple. It is because of agriculture and population rising. When the population grew the human race needed to find ways to feed more and more people. That is when we decided to stay in one place and grow food. We didn’t want to have to follow the herds and depend on gathering the random apples anymore. The human body hasn’t evolved hardly at all since our hunter-gatherer ancestors so why should our diet evolve? The Paleo Diet is a very simple one. It can be broken down into two sections: 1 What you can eat and 2 What you shouldn’t eat. All fruits are fair game. Try to not go overboard with fruits each day. Coconut/Olive/Uncured Bacon Grease all work. You can also have honey in small amounts. The diet is simple. Summarized it is this: Do not eat anything processed. No dairy, bread, pasta, potatoes, beans, legumes or added sugar. There is only one beverage that can honestly be called “Paleo”. Water. That doesn’t mean you can’t have other drinks. Tea and coffee are alright to drink as long as you drink them black. Remember, no added sugar and no dairy. To get all the benefits of this diet you only need to follow it 80% of the time. My challenge to you is to try this diet for 3 weeks. That’s not even a month. See how you feel after those 3 weeks. If you want to feel how bad grains and dairy are making you feel try eating mac and cheese after your challenge. Trust me, you’ll feel the difference. Buy “The Paleo Solution” by Robb Wolf for a more detailed description of the diet.